For foreign shipping we include two jar of deydrated shiitake insteat of fresh shiitake. 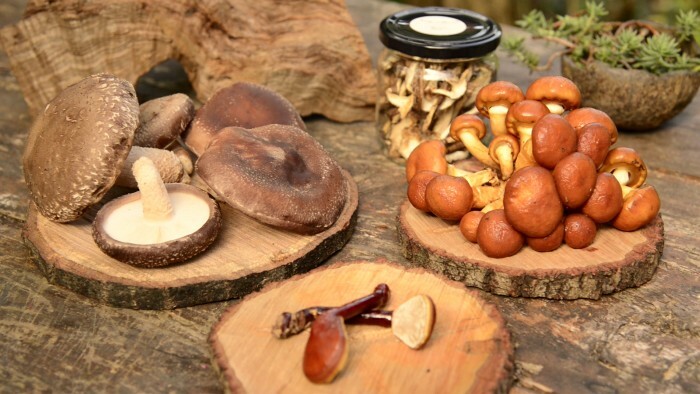 A complete guided tour of our current forest farm to discover the whole shiitake cultivation process, ending with a mushroom tasting session showcasing different cooking methods. 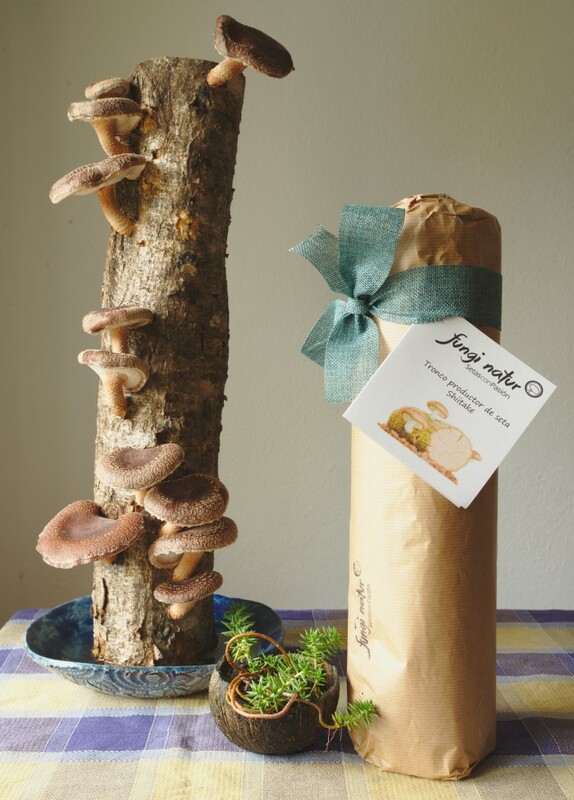 Grow your own shiitake mushrooms at home with this oak log ready to start producing. National shipping included; contact us for international shipping rates (info@funginatur.com). A complete video course including both theory and practice. 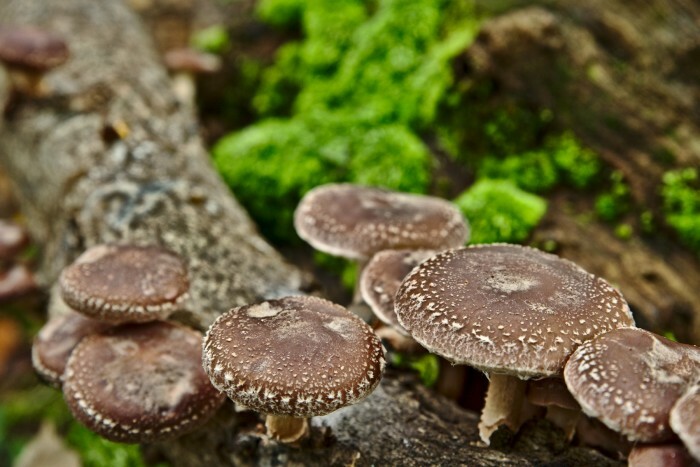 Learn step-by-step everything you need to know to easily grow organic shiitake mushrooms in your garden. 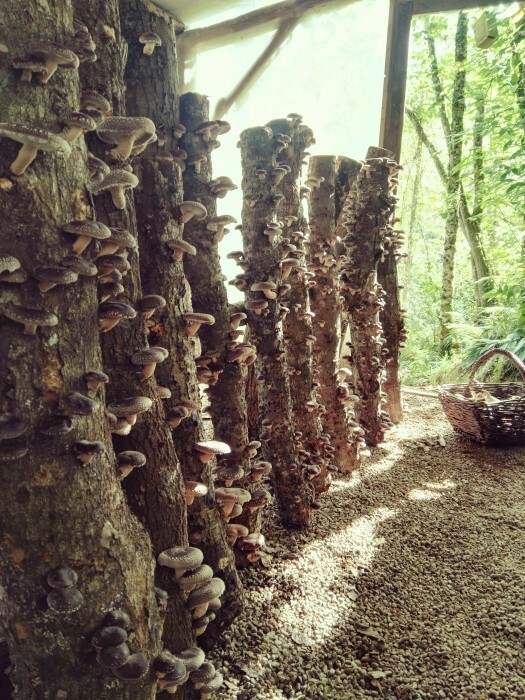 Grow your own shiitake mushrooms at home with this oak log ready to start producing + complete guided tour of our current forest farm to discover the whole shiitake cultivation process, ending with a mushroom tasting session showcasing different cooking methods. 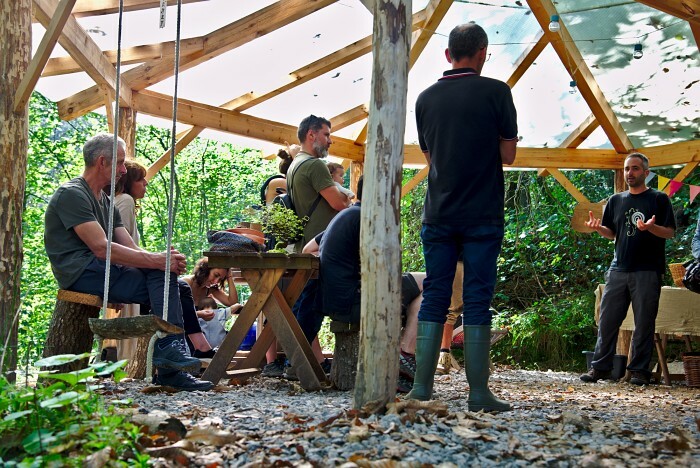 A complete 3 hour course on the Fungi natur Farm. 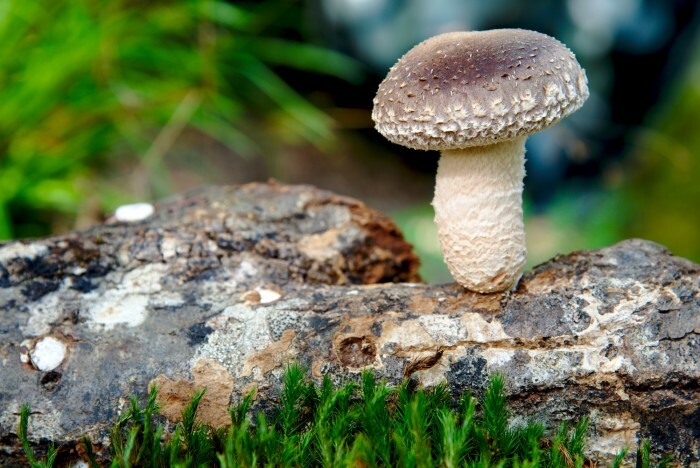 This course will have both theoretical and practical parts, learning about mushroom biology and cultivation. Each participant will prepare their own shiitake log. 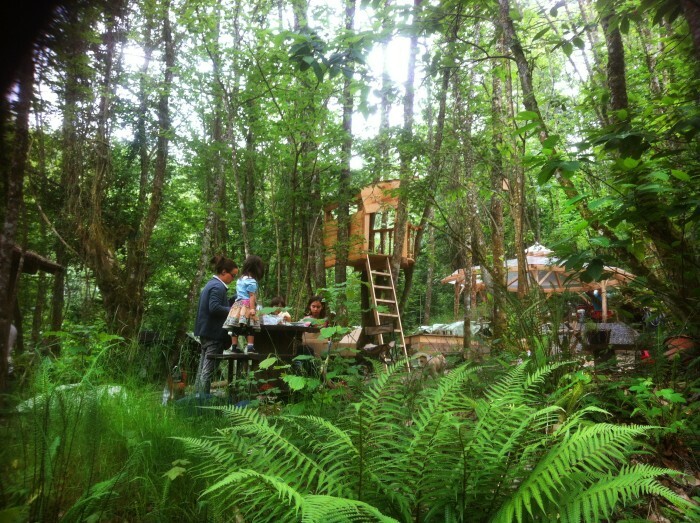 Invitation for two people to a very special spring party in the forest! 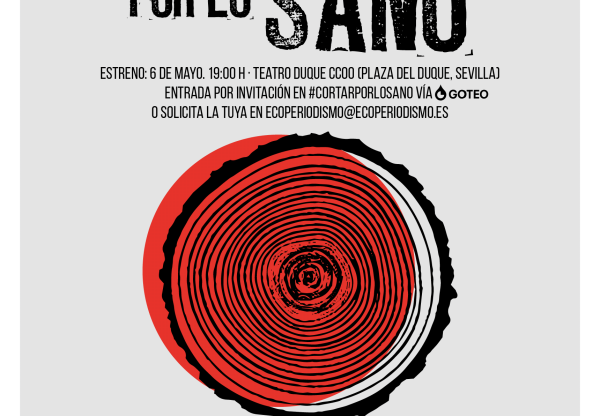 There will be eco-snacks and drinks, childrens activities and live music through the night!. And take your own Shiitake log when you leave! 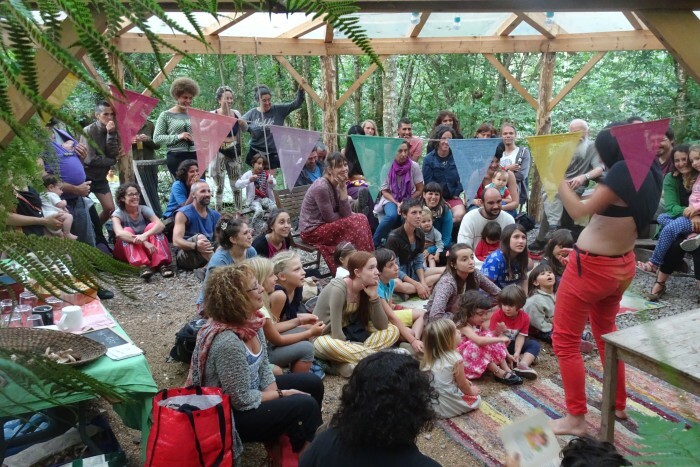 Invitation for two people to a very special spring party in the forest! There will be eco-snacks and drinks, childrens activities and live music through the night! And take your own Shiitake log when you leave! 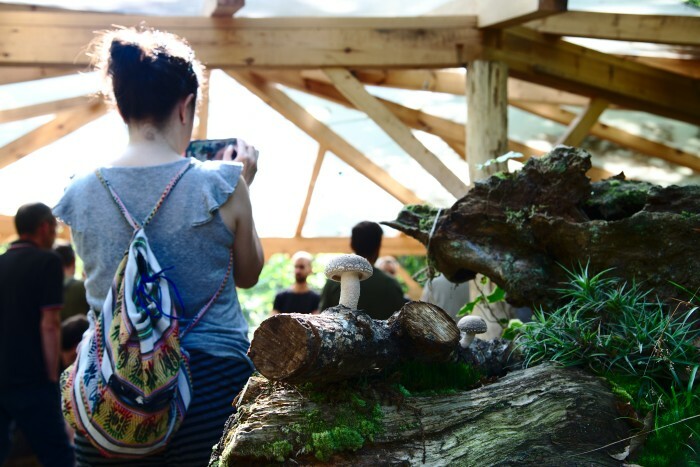 + A complete 3 hour course on the Fungi natur Farm. 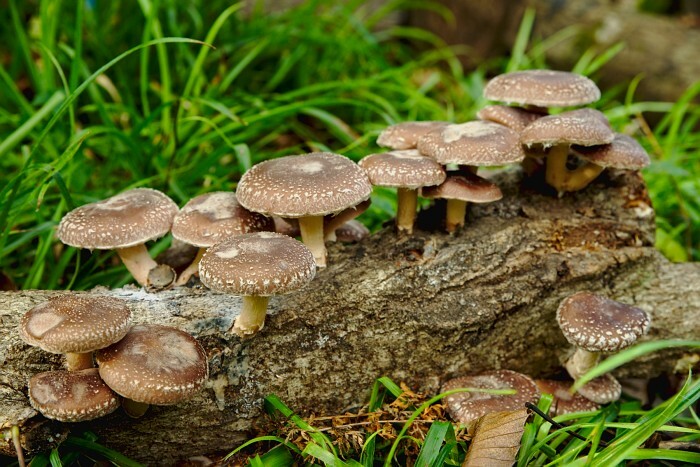 This course will have both theoretical and practical parts, learning about mushroom biology and cultivation. Each participant will prepare their own shiitake log. A complete self-cultivation kit with all you need to start your own shiitake mushroom production. 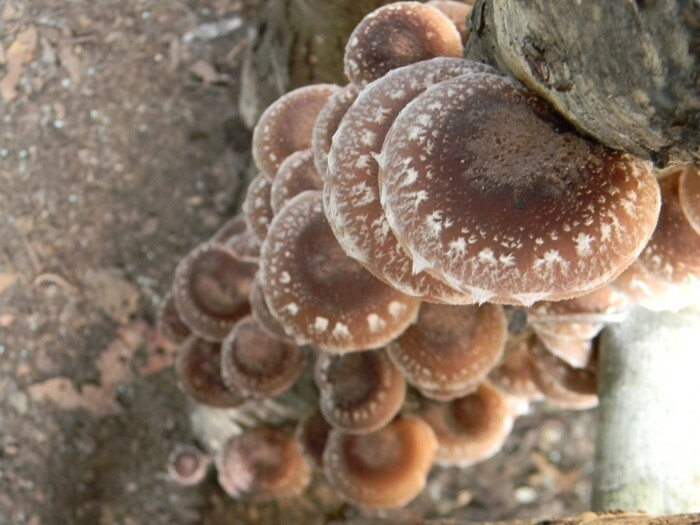 Including: Shiitake cultivation manual + Shiitake mycelium (enough for 40 logs!) + Special japanes drill bit + Beeswax (to seal the inoculation holes). You will only need to get the logs. With this option you will become a shiitake mushroom farmer! It includes the Complete mushroom-farming course + 40 log shiitake self-cultivation kit+ shiitake log ready to produce. 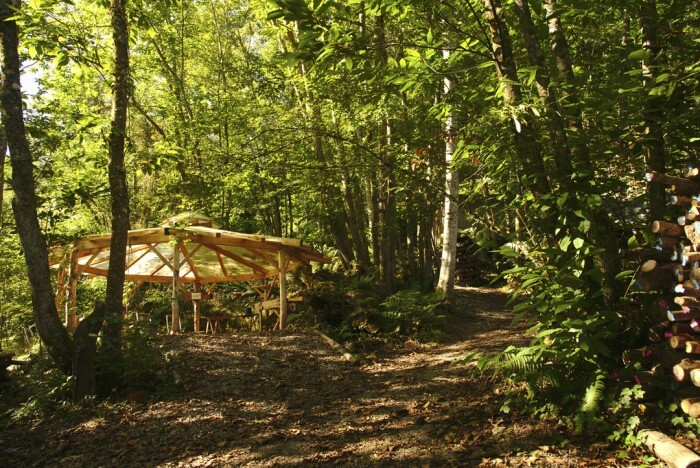 Awsome 5-course tasting menu in the forest + Spring forest party + Shiitake log. 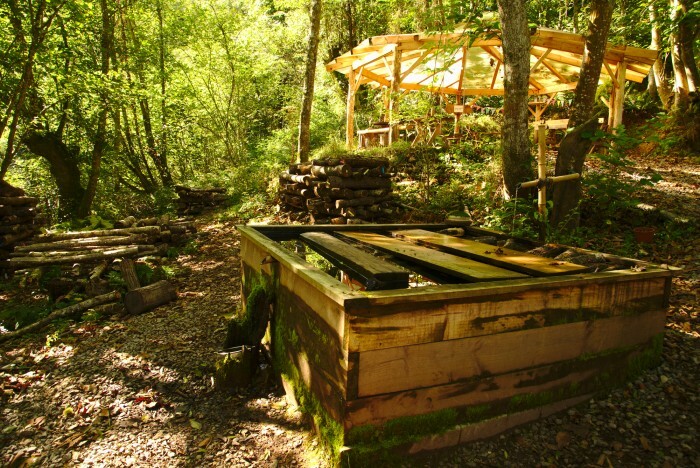 Awesome 5-course tasting menu in the forest by 'Con-fusion Comidas Eco-Catering' + Invitation for two people to a very special spring party in the forest! + Shiitake log ready to produce. If you live in a rural area and want to develop a sustainable mushroom cultivation project or have a forested property and want to get some yield from it, we can give you personal advice and all materials and tools needed for your project. And of course you and a companion are invited to the spring party in the forest! 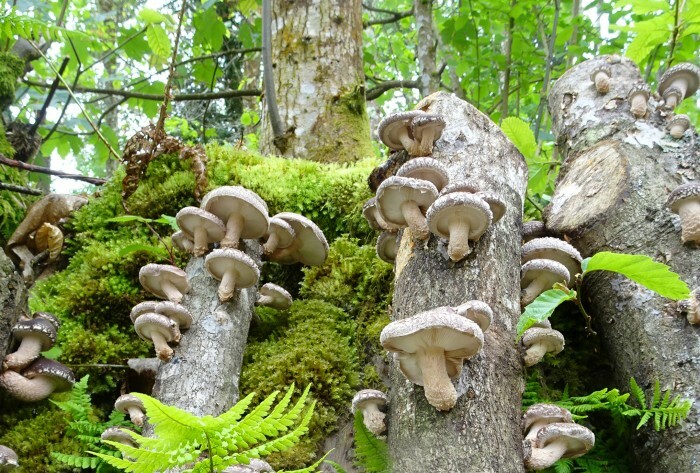 Our old farm is not big enough for our growing needs, so we now require a new property to upscale mushroom production a 1Ha forested farm with a neighbouring river that will give us the correct humidity and shade for growing mushrooms. 2. Fruiting house with shading net for mushroom production. 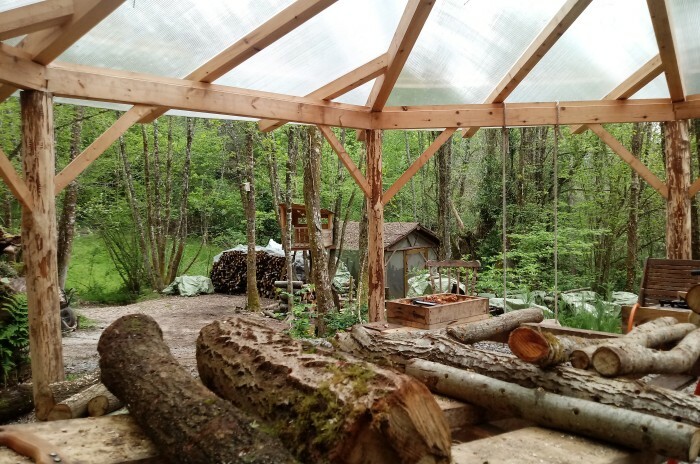 We are going to build a wood structure with a green roof and mosquito net where we keep the logs when producing mushrooms to protect them from rain, slugs and insects. 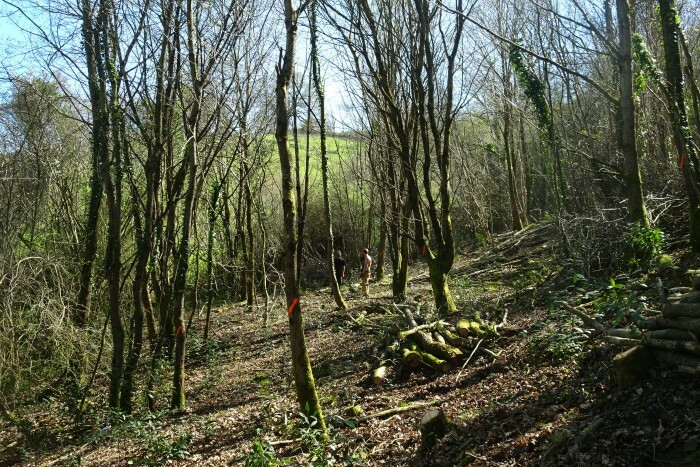 We need around 1Ha forest for sustainable management of forest resources, to extract high quality oak and chestnut logs for mushroom production. We need dense canopy shade on the new farm for optimum mushroom growing conditions, so we will be planting more riverside tree species. We will build a small bridge over the Viacaba river for easier access to the farm. 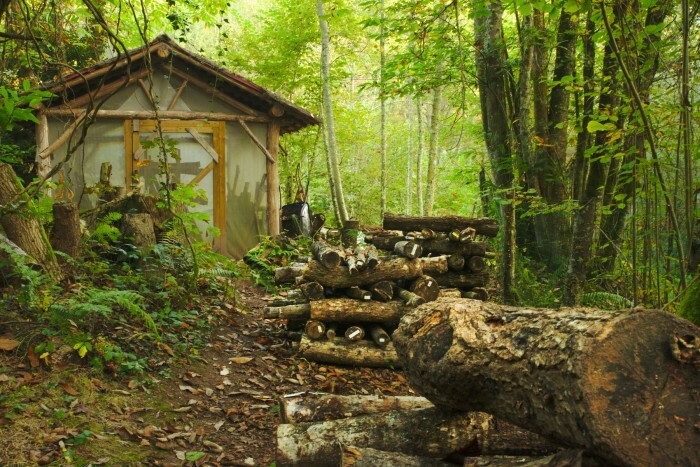 Beginning in 2016, we have been growing mushrooms in a little forest in Asturias (North-west Spain). 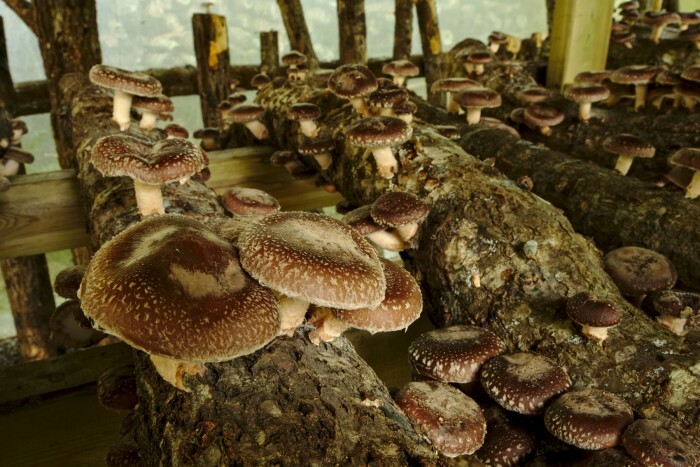 We mainly grow shiitake mushrooms using a traditional japanese method, based on the natural conidtions and substrates where mushrooms grow in nature. 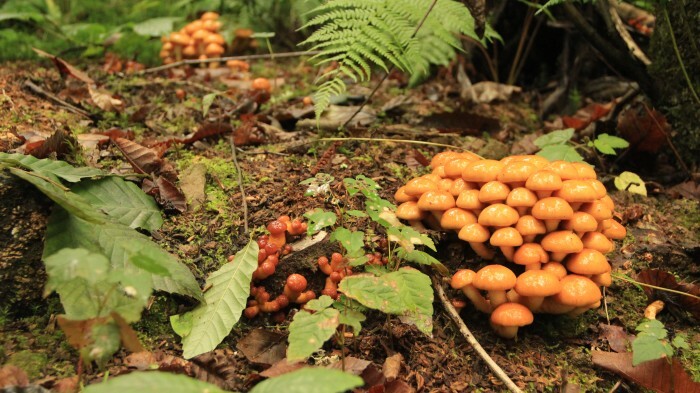 These mushrooms grow in high-humidity areas under the shade of the forest canopy. Mushrooms cultivated this way are high quality and sustainable. 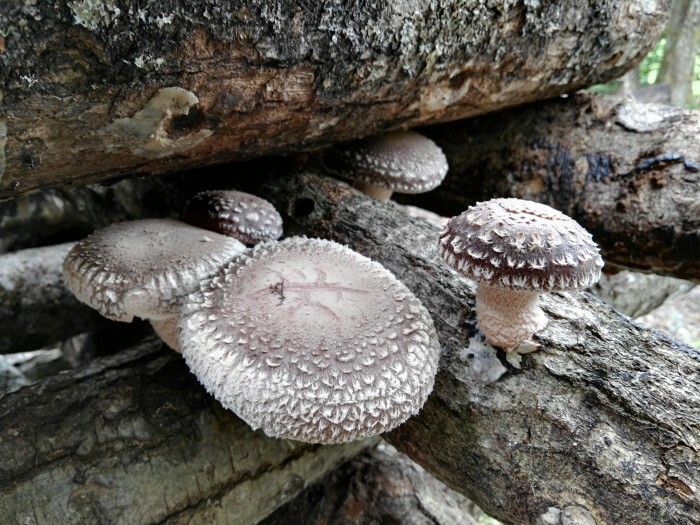 Our shiitake mushrooms are inoculated in oak logs that have been obtained from a selective cull and pruning process on our own forest farms; careful wood extraction is fundamental to our philosophy of working in an environmentally-conscious manner- sustainable management of native forests increases their value and promote their conservation. Our forest is not big enough to continue developing our project. We need new forest farm to continue our work. The aim of this crowdfunding campaign is to support part of the purchase of a new farm, as well as buildings necessary to the mushroom-growing process. This new farm will create two new jobs that will contribute to rural development based on a sustainable way of life. Employing the forest natural enviroment we produce a healthy, organic and high quality product. We promote local and small market instead of the mainstream market companies. A sustainable management of the native forest to get our mushroom substrate give a new valuable resource to forest. 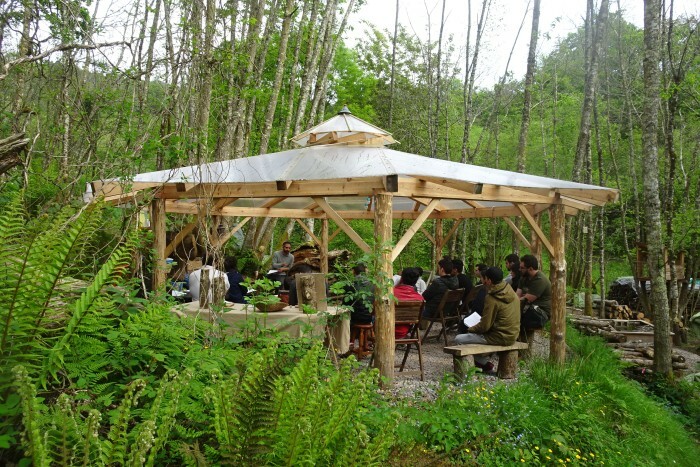 We promote the environmental education trough workshops, guided visits and mushroom courses. We offer the posibility to “do it yourself” with our mushroom cultivation kits and tools. Our philosophy is to promote environmental awareness and give value to native forest. We belive in a sustainable agrifood developing model in rural areas. Our activity is mainly related with local and rural developement, however have bigger influence and general interest by defending a sustainable food production model and promote a healthy way of live and eating. Leandro Meléndez is a biologist with a master's degree in Biological resources conservation techniques. He has worked as a field technician in various nature reserves and protected areas and participated in several climate change and species conservation studies. 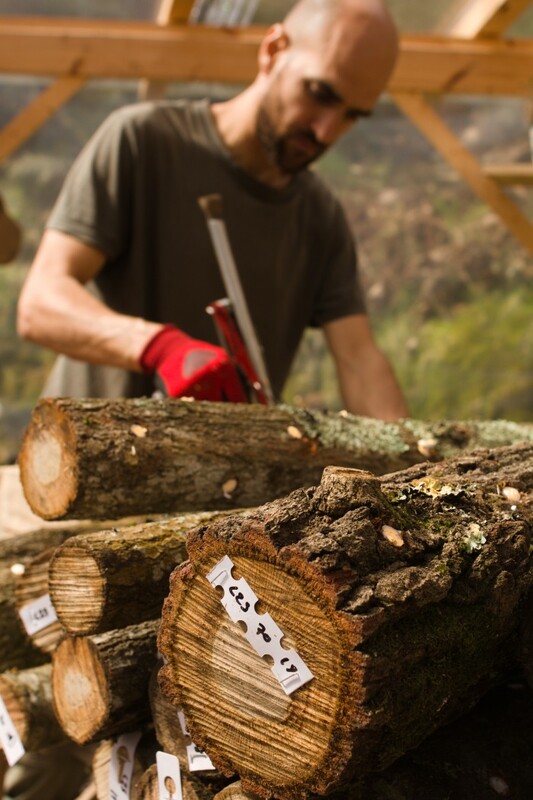 In 2013 he started the Fungi Natur project, growing shiitake mushrooms on an initial 100 logs in a small village in Asturias in Northwest Spain. 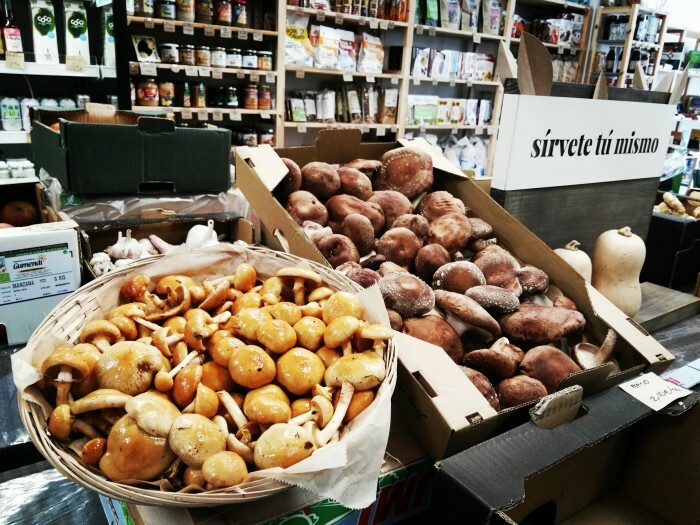 In 2017 Gerard Nierga and Macario Iglesias incorporated to Fungi natur looking for a more natural way of life. Gerard and Macario have collaborated with several projets related with organic farming, permaculture and social economy. Macario used to work has an architect specializet in natural materials and bioconstruction. Our guiding principle is commitment to social economy, environmental sustainability and rural development. In this way we produce a healthy, high-quality and sustainable product, distributed locally and directly by ourselves to our clients and customers.